Lufthansa has washed blood from its hands by ending the transport of dogs and cats to laboratories, where they are subject to certain suffering and death...Now we urge Lufthansa to extend that same protection to animals of all species, who suffer just as much as dogs and cats do. 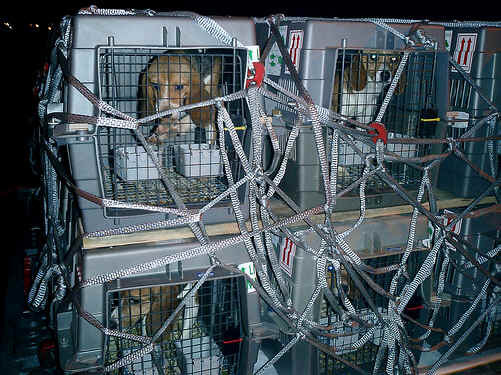 Less than 24 hours after People for the Ethical Treatment of Animals (PETA) released photos showing 50 terrified beagles being transported by Lufthansa airlines to a laboratory in Scotland--and after the group posted an action alert on its popular Web site PETA.org--global transport company Lufthansa has announced a new policy prohibiting the transport of dogs and cats to laboratories. PETA's international affiliates took the campaign global by posting similar alerts on their respective sites. "Lufthansa has washed blood from its hands by ending the transport of dogs and cats to laboratories, where they are subject to certain suffering and death," said PETA Vice President of Laboratory Investigations Kathy Guillermo. "Now we urge Lufthansa to extend that same protection to animals of all species, who suffer just as much as dogs and cats do." The dogs in the photos PETA released were being shipped to a Charles River Laboratories (CRL) testing facility in Scotland where they were likely poisoned and killed in drug and pesticide tests. CRL is one of the world's largest breeders and users of animals for experiments and has a long history of violating animal protection laws. The company has violated federal laws more than two dozen times since 2007 and was recently fined $14,000 by the U.S. Department of Agriculture for the negligent deaths of 33 monkeys at their Reno and Sparks, Nev., facilities. The dogs in the photos originated from Marshall Farms, a major breeder of dogs, pigs, and ferrets for use in experiments. Since 2007, the company has been cited for more than 20 Animal Welfare Act violations, including failure to provide adequate veterinary care to animals. Lufthansa joins Air Canada, which stopped shipping dogs to laboratories in 2007, and major airline carriers Cathay Pacific and Qantas, both of which refuse to transport any animals who are destined for laboratories. Many other airlines restrict the practice. PETA is now working to persuade Lufthansa to extend its policy to animals of all species.